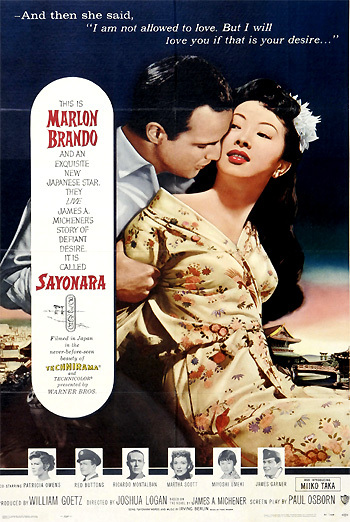 Sayonara (1957) is an adaptation from a James Michener novel, a story about American soldiers serving in Japan during the Korean War. Ordinarily an officer who is by-the-book, Gruver must take a position when a buddy of his, an enlisted man Joe Kelly (Red Buttons) falls in love with a Japanese woman Katsumi (Miyoshi Umeki) and marries her. Gruver risks his position by serving as best man at the wedding ceremony. I am not allowed to love. But I will love you if that is your wish. He is asked by a reporter to comment on his proposed marriage to the Japanese woman: "Major, the big brass are going to yell their heads off about this, and the Japanese aren't going to like it much either. Have you got anything to say to them, sir?"